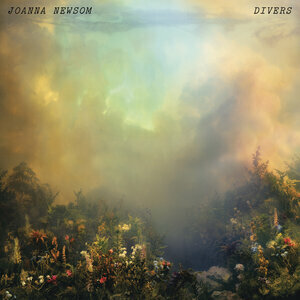 Joanna Newsom, an American Harpist, Keyboardist and singer is back with her fourth album, ‘Divers’ on Drag City. Since beginning her recording career in the early 00’s, with her first two EP’s, ‘Walnut Whales’ and ‘Yarn and Glue’, she has released three previous albums via record label Drag City. Over her three previous albums fans and critics have watch Newsom grow as an artist, her vocals growing more precise without losing their personality and her arrangements grow more lavish and expansive alongside her growing list of collaborators. Although, through her musical intellectualism, Newsom’s mainstream appeal has been limited success ahs always seemed to follow. Throughout her previous albums Newsom has always attached the album to a distinct point I her narrative, however, with her latest offering she has attempted something outside her traditional career arc. The album opens with the soft sounds of ‘Sapokanikan’ a soft and gentle introduction to the album with Newsom’s unmistakable vocals, comparable to that of Kate Bush. Throughout the album the space and quiet moments allow Newsom to play off her grand gestures through tracks such as with tracks such as ‘Leaving The City’ and ‘Goose Eggs’ showcasing previously rare employments of percussion. Throughout the album there is a sense of intimacy and closeness that grasps the listener through tracks such as ‘Sprout And The Bean’ featuring nothing but Newsom’s vocals and harp, each combining perfectly to show case Newsom’s talents not only as a singer but well-established musician. Similarly ‘Divers’ offers up a stripped back melody showing Newsom at her most skeletal, allowing the listener to be within touching distance, her vocals piercing through, showing a more intimate portrayal of the artist. Throughout the album creativity and attention to detail seem to be the key, musically well established and execute extremely well. Tracks such as ‘Anecdotes’ and ‘The Things I Say’ seem to reach out beyond the constraints of the song, transcending into a beauty that epitomises Newsom’s abilities to connect with her audience. The penultimate track ‘A Pin-Light Bent’ once again employs the minimalist, skeletal sound that Newsom works so well, allowing the audience to bask in the soft subtle melodies created. Throughout a musicians career music can often become repetitive and stagnent, most artists, by their fourth album, settle into a particle formula or comfort however Newsom delivers such complex, nuance music, filled with arcane constructions. Allowing her to settle in and enjoy her style whilst simultaneously pushing the boundaries of her own creativity.